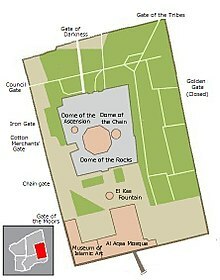 The Temple Mount, located in Jerusalem, can be accessed through eleven gates, and contains a further six sealed gates. The following is an anti-clockwise list of gates which open onto the Temple Mount. Currently eleven gates are open to the Muslim public. Non-Muslims are only permitted to enter through the Mughrabi gate. The Gate of the Tribes, (Arabic: باب الأسباط‎, Hebrew: שער השבטים‎ , is located at the north-eastern corner of the Temple Mount. The Gate of Remission, (Arabic: Bab al-Huttah‎), is located on the north side. The Gate of Darkness, (Arabic: Bab al-Atim‎), is located on the north side. The Gate of Bani Ghanim, (Arabic: Bab al-Ghawanima‎), is located on the north-western corner. A twelfth gate still open during Ottoman rule is now closed to the public: Bab as-Sarai (Gate of the Seraglio, or of the Palace); a small gate to the former residence of the Pasha of Jerusalem; in the northern part of the western wall, between the Bani Ghanim and Council gates. The Council Gate, (Arabic: Bab al-Majlis‎), also known as the Inspector's Gate (Arabic: Bab an-Nazir or Nadhir‎), is located on the northern side of the western Temple Mount wall. The Iron Gate, (Arabic: Bab al-Hadid‎, Hebrew: Shaar Barzel‎) is located on the western side, near the Little Western Wall. The Cotton Merchants' Gate, (Arabic: Bab al-Qattanin‎Hebrew: שער מוכרי הכותנה‎), is one of the most beautiful gates that leads onto the Temple Mount. It was built by the ruler of Damascus, Tankiz, during the reign of Mamluk Sultan ibn Qalwun, as marked by an inscription over the door. Since this site is the closest a person can get to the Foundation Stone without setting foot on the mount itself, the gate was a popular place of prayer for Jews during the 19th century. The Ablution Gate, (Arabic: Bab al-Matharah باب المطهرة‎), is located on the western flank. The Tranquility Gate, (Arabic: Bab as-Salam‎), also Gate of the Dwelling (Bab as-Sakina), is located in the central part of the western wall. The Chain Gate, (Arabic: باب السلسلة‎, Bab as-Silsileh; Hebrew: Shaar HaShalshelet‎), located on the western flank, it may have been the location of the Kipunos (Coponius) Gate which existed during the Second Temple period. 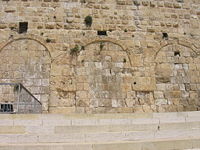 The Gate of the Moors, known in Israel as Mughrabi Gate, (Arabic: باب المغاربة‎, Bab al-Magharbeh; Hebrew: Shaar HaMughrabim‎), is located on the western flank, directly over the Herodian-period gate known as Barclay's Gate. Over the years, the ground level outside Barclay's Gate rose by many meters above its threshold and Barclay's Gate was finally walled up in the 10th century. At some stage, probably in the 12th century and maybe even later, a new gate called Bab al-Magharbeh was installed in the Western Wall above Barclay's Gate, at the level of the Temple Mount esplanade. It was named after the residents of the adjacent neighborhood, who had come to Jerusalem from Morocco in the days of Saladin. This gate is open to this day and has been since 1967 the only entrance to the Temple Mount accessible to non-Muslims. The gate, specifically the excavation of the historic ramp leading up to it, has been a point of contention between Israelis and Arab Muslims. In February 2004, a wall which supported the 800-year-old ramp jutting out from the Western Wall and leading up to the Gate of the Moors, partially collapsed. Israeli authorities believed a recent earthquake and snowfall may have been responsible, while Hamas and Muslim officials blamed the collapse on Israelis working in the area. In 2007, the Israel Antiquities Authority (IAA) built a temporary wooden pedestrian bridge to the Gate of the Moors. No agreement could be reached over a more permanent structure. The damaged ramp, situated beneath the bridge and not connected to it, consists of an accumulation of archaeological layers which have been excavated by the IAA, who removed surface material and made visible several ruined structures. This was done in contravention to the action plan initially submitted by the IAA to the UNESCO. In 2013, an archaeological excavation was conducted at the Mughrabi Gate by Hayim-Her Barbe, Roie Greenvald, and Yevgeni Kagan, on behalf of the Israel Antiquities Authority (IAA). The Golden Gate, (Arabic: باب الرحمة‎, lit. 'Bab al-Rahema', "Mercy Gate"; Hebrew: Sha'ar Harachamim‎, "Gate of Mercy"), located on the eastern wall of the Temple Mount was probably built in the 520s CE, as part of Justinian I's building program in Jerusalem, on top of the ruins of an earlier gate in the wall. An alternate theory holds that it was built in the later part of the 7th century by Byzantine artisans employed by the Umayyad khalifs. It has two vaulted halls which lead to the Door of Mercy, Bab al-Rahma, and the Door of Repentance, Bab al-Taubah. Closed by the Muslims in 810, reopened in 1102 by the Crusaders, it was walled up by Saladin after regaining Jerusalem in 1187. Suleiman the Magnificent rebuilt it together with the city walls, but walled it up in 1541, and it stayed that way until today. The 1st-century historian, Josephus, who mentions the "eastern gate" in his Antiquities, makes note of the fact that this gate was considered within the far northeastern extremity of the inner sacred court. According to the Mishnah, there was formerly a causeway which led out of the Temple Mount eastward over the Kidron valley, extending as far as the Mount of Olives. Rabbi Eliezer, dissenting, says that it was not a causeway, but rather marble pillars over which cedar boards had been laid, used by the High Priest and his entourage. This gate was not used by the masses to enter the Temple Mount, but reserved only for the High Priest and all those that aided him when taking out the Red Heifer or the scapegoat on the Day of Atonement. Barclay's Gate lies under the Moroccans' Gate (Moor's Gate) and is one of the four Temple Mount's original gates on its western side. Its Arabic name is Bab an-Nabi, "Gate of the Prophet [Muhammad]" (see Le Strange, Palestine Under the Moslems p. 189) - not to be confused with the Triple Gate, which has the same Arabic name. Barclay's Gate is named after James Turner Barclay who was a Christian missionary in Jerusalem in the mid-19th century, and who discovered the main structure of the gate buried underground within the Temple Mount, in 1852. Several researchers identified it as one of the Second Temple period gates, possibly the Coponius Gate, which is mentioned in Jewish and Christian sources of the period. The gate was blocked with stones at the end of the 10th century and the internal gate room was transformed into a mosque dedicated to Buraq. Today the room is closed and entrance to it is prohibited without the approval of the Waqf. After the Six-Day War, the Israel Religious Affairs Ministry and Prof. Benjamin Mazar, who was at the time conducting the dig outside the southern wall of the Temple Mount, planned to uncover this gate, but they were prevented from doing so by both Jewish and Muslim religious leaders. The Huldah Gates comprise two sets of bricked-up gates in the southern wall of the Temple Mount. The fact that the original entrance gateways still exist reflects an ancient promise cited in a work of rabbinic literature, Shir ha-Shirim Rabbah: "The Kohen Gate and the Huldah Gate were never destroyed and God will renew them". [dubious – discuss] The 1st-century historian, Josephus, mentions these gates in his Antiquities: "...the fourth front of the temple [mount], which was southward, had indeed itself gates in its middle." The set on the right is a triple-arched gate, known as the Triple Gate (Arabic: Bab an-Nabi, "Gate of the Prophet [Muhammad]") - not to be confused with Barclay's Gate, which has the same Arabic name. Each of the gates once led into a passageway stretching underneath the esplanade of the Mount, and then to steps leading up to the esplanade itself. The Single Gate is located along the southern wall. It once led to the underground area of the Temple Mount known as Solomon's Stables. Bab al-Jana'iz, or Bab al-Buraq (Gate of the Funerals/of al-Buraq) is a hardly noticeable postern, or maybe an improvised gate, once opening into the eastern wall a short distance south of the Golden Gate. Wikimedia Commons has media related to Gates of the Temple Mount. ^ Eliyahu Wager (1988). Illustrated guide to Jerusalem. Jerusalem: The Jerusalem Publishing House. p. 35. ^ a b "Tourism Min. plan to widen Jewish access to Temple Mount angers Palestinians". Haaretz. 7 October 2014. Retrieved 5 November 2014. ^ a b "Israel issues tender for new settlement units". Al Jazeera. 18 December 2011. Retrieved 5 November 2014. ^ Baruch, Yuval. "The Mughrabi Gate Access - The Real Story". Israel Antiquities Authority. Retrieved 2007-07-10. ^ Shragai, Nadav (February 12, 2007). "The gate of the Jews". Haaretz. Retrieved 2007-07-10. ^ Charles Wilson (1879). Quarterly Statement for 1879. London: Palestine Exploration Fund. Retrieved 24 September 2015. Over the doorway of the postern there is a sort of lintel, but there are no regular jambs, and the whole has more the appearance of a hole broken through the masonry and afterwards roughly filled up than that of a postern in a city wall ; still it probably marks the site of Mejr-ed-Din's Gate of Burak.